Beasts Stephen R. George (Zebra 0-8217-2682-X, Jun 89 [May 89], $3.95, 350pp, pb) Sf/horror novel about brutal murders committed by the victims of a deadly virus. Brain Child Stephen R. George (Zebra 0-8217-2578-5, Feb 89 [Jan 89], $3.95, 352pp, pb) Horror novel. Child with strange powers brings horrible things to life. Dark Miracle Stephen R. George (Zebra 0-8217-2788-5, Oct 89 [Sep 89], $3.95, 416pp, pb) Horror novel. A new spring gushes forth, causing miraculous cures followed by death. Chess with a Dragon David Gerrold (Beaver 0-09-960950-9, Nov 89 [Oct 89], £2.99, 127pp, pb, cover by Pete Lyon) Reprint (Walker 1987) young-adult sf novel. A Day for Damnation David Gerrold (Bantam Spectra 0-553-27765-0, Mar 89 [Feb 89], $4.50, 423pp, pb) [War Against the Chtorr] Sf novel of alien invasion, sequel to A Matter For Men. This is expanded by about 50% from the 1985 Timescape edition. The War Against the Chtorr, Book Two. A Matter for Men David Gerrold (Bantam Spectra 0-553-27782-0, Feb 89 [Jan 89], $4.50, 435pp, pb) [War Against the Chtorr] Sf novel about an alien invasion. This is revised and substantially expanded from the 1983 Timescape edition. Book One of The War Against the Chtorr. A Rage for Revenge David Gerrold (Bantam Spectra 0-553-27844-4, Apr 89 [Mar 89], $4.50, 517pp, pb) [War Against the Chtorr] Sf novel, book three of the War Against the Chtorr series. Dark Veil Nickolae Gerstner (Ballantine 0-345-36163-6, Sep 89 [Aug 89], $3.95, 213pp, pb) Psychic suspense novel. Reach Edward Gibson (Doubleday Foundation 0-385-26150-0, Jun 89 [May 89], $18.95, 334pp, hc) Near-future sf novel by a former astronaut. Mona Lisa Overdrive William Gibson (QPBC, Apr 89, $8.95, 260pp, tp) [Neuromancer] Reprint (Gollancz 1988) sf novel, third in the Neuromancer series. This is identical to the Bantam Spectra hardcover except it lacks an ISBN and has the jacket printed as the soft cover. Mona Lisa Overdrive William Gibson (Grafton 0-586-20747-3, Sep 89, £3.50, 316pp, pb, cover by Steve Crisp) [Neuromancer] Reprint (Gollancz 1988) sf novel. Volume Three in the Cyberspace trilogy. Mona Lisa Overdrive William Gibson (Bantam Spectra 0-553-28174-7, Dec 89 [Nov 89], $4.95, 308pp, pb, cover by Will Cormier) [Neuromancer] Reprint (Gollancz 1988) sf novel, third in the Neuromancer series. Neuromancer William Gibson (Grafton 0-586-06645-4, Sep 89, £3.50, 317pp, pb, cover by Steve Crisp) [Neuromancer] Reissue (Ace 1984) sf novel. Volume One in the Cyberspace trilogy. Yours Till Forever David Gifaldi (Harper & Row/Lippincott 0-397-32355-7, Oct 89 [Sep 89], $11.95, 90pp, hc) Serious young-adult fantasy with sf elements about reincarnation. Gigers Alien H. R. Giger (Morpheus International 0-9623447-0-2, Oct 89, $39.95, 76pp, hc) Art book, collecting Gigers designs for the film. Some of the most disturbing and effective fantasy/horror art ever produced (CNB). The original edition was small and is quite rare. First American edition (Big O 1979). Gigers Alien H. R. Giger (Titan 1-85286-219-X, Nov 89, £14.95, 75pp, tp) Reprint (Big O 1979) classic collection of artwork for the film Alien. This edition adds a new section of text (on the Oscar) and an update on Gigers life. Monster Mashers Mel Gilden (Avon Camelot 0-380-75785-0, Jul 89 [Jun 89], $2.75, 91pp, tp) [Fifth Grade Monsters] Childrens humorous horror fantasy, sixth book of the Fifth Grade Monsters series. Packaged by General Licensing Company; a Byron Preiss subsidiary. Outer Space and All That Junk Mel Gilden (Harper & Row/Lippincott 0-397-32307-7, Oct 89 [Sep 89], $12.95, 167pp, hc) Young-adult humorous sf novel about a boy whose uncle is hiding abandoned aliens in a collection of old junk. Things That Go Bark in the Park Mel Gilden (Avon Camelot 0-380-75786-9, Oct 89 [Sep 89], $2.75, 88pp, tp) [Fifth Grade Monsters] Childrens humorous fantasy, seventh in the Fifth Grade Monsters series. Packaged by General Licensing Company, a Byron Preiss subsidiary. Yuckers! Mel Gilden (Avon Camelot 0-380-75787-7, Oct 89 [Sep 89], $2.75, 91pp, tp) [Fifth Grade Monsters] Childrens humorous fantasy, eighth in the Fifth Grade Monsters series. Packaged by General Licensing Company, a Byron Preiss subsidiary. Time Keepers Richard Gill (Merlin 0-86303-460-8, Nov 89 [Oct 89], £4.95, 79pp, tp) Original sf collection. Wizenbeak Alexis A. Gilliland (Ballantine Del Rey 0-345-36116-4, Sep 89 [Aug 89], $3.95, 296pp, pb) [Wizenbeak] Reprint (Bluejay 1986) humorous fantasy novel. Greenbriar Queen Sheila Gilluly (NAL Signet 0-451-16491-1, Dec 89, $3.95, 330pp, pb) [Greenbriar Queen] Reissue (NAL Signet 1988) fantasy novel; third printing. Ritnyms Daughter Sheila Gilluly (NAL Signet 0-451-16341-9, Dec 89 [Nov 89], $3.95, 351pp, pb) [Greenbriar Queen] Fantasy novel, third book in the Greenbriar trilogy. The Yellow Wallpaper and Other Writings Charlotte Perkins Gilman (Bantam 0-553-21375-X, Nov 89, $4.50, 240pp, pb, cover by Gertrude Fiske) Collection of eight stories, plus selections from two non-fiction works plus selections from the classic utopian fantasy novel Herland, edited and with an introduction by Lynne Sharon Schwartz. The stories include the horror classic The Yellow Wallpaper and the gender-switch fantasy If I Were a Man. Incident at Badamya Dorothy Gilman (Doubleday 0-385-24760-5, Apr 89, $16.95, 204pp, hc) Ghost story/political adventure thriller set in Burma in 1950. Bloodstorm Heather Gladney (Ace 0-441-74957-7, Apr 89, $3.95, 277pp, pb) [Song of Naga Teot] Fantasy novel, book two of The Song of Naga Teot. Shields Lady Amanda Glass (Popular Library 0-445-20448-6, Jul 89 [Jun 89], $3.95, 341pp, pb) Romance/sf novel with fantasy elements. A mercenary and a businesswoman from different cultures on a lost Earth colony fall in love while saving their world. This is being marketed as a futuristic romance. Glass is a pseudonym for Jayne Krentz. Jaiyavara: A Novel Eleanor Glaze (St. Lukes 0-918518-60-1, Sep 88 [Jan 89], $16,95, 281pp, hc) Post cataclysm feminist novel. Released in 1988, but not seen until 1989. Clicking Stones Nancy Tyler Glenn (Naiad Press 0-941483-31-2, Apr 89 [Mar 89], $8.95, 269pp, tp) Metaphysical lesbian near-future sf novel. The Last War Martyn Godfrey (Macmillan Collier 0-02-041791-8, Oct 88 [Feb 89], $2.95, 91pp, pb) Young-adult post-holocaust sf novella, a Collier Fast Fiction book for easy reading. Illustrations by Greg Ruhl. First American edition (Collier Macmillan Canada 1986). The Snake Oil Variations Parke Godwin (Doubleday Foundation 0-385-26350-3, Aug 89 [Jul 89], $6.95, 212pp, tp) [Waiting for the Galactic Bus] Comic sf novel, sequel to Waiting for the Galactic Bus. A hardcover edition (-26350-3, $19.95) was announced but not seen. The Snake Oil Wars Parke Godwin (SFBC #15579, Dec 89 [Nov 89], $4.98, 177pp, hc, cover by Chris Consani) [Waiting for the Galactic Bus] Reprint (Doubleday Foundation 1989) sf novel, sequel to Waiting for the Galactic Bus. Waiting for the Galactic Bus Parke Godwin (Bantam Spectra 0-553-28066-X, Jun 89 [May 89], $3.95, 279pp, pb) [Waiting for the Galactic Bus] Reprint (Doubleday Foundation 1988) satiric sf novel about the creators of mankind. Crystals of Air and Water Stephen Goldin (Bantam Spectra 0-553-27711-1, Feb 89, $3.95, 292pp, pb) [Parsina Saga] Fantasy novel. The third in the Parsina Saga of Arabian adventures. Michael and the Secret War Cassandra Golds (Macmillan Atheneum 0-689-31507-4, Oct 89 [Nov 89], $13.95, 183pp, hc, cover by Stephen Marchesi) Young-adult fantasy novel. A boy is drawn into a secret magical war that is waged on the fringes of everyday life. A first novel. First American edition (Angus & Robertson, Australia 1985). 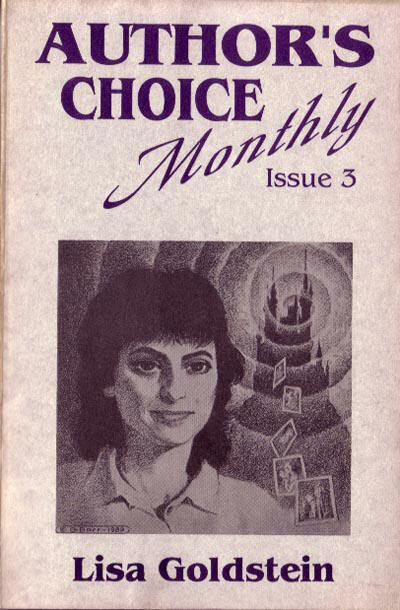 Authors Choice Monthly Issue 3: Daily Voices Lisa Goldstein (Pulphouse, Dec 89, $4.95, 99pp, tp, cover by George Barr) Collection of five stories with an introduction by the author. Also available in a signed hardcover edition ($25.00). A signed deluxe leatherbound edition ($50.00) was announced but not seen. Tourists Lisa Goldstein (Simon & Schuster 0-671-67531-1, Jul 89, $17.95, 239pp, hc) Contemporary fantasy set in an imaginary country. A Spell of Deceit Laurie Goodman (Ballantine Del Rey 0-345-35596-2, Feb 89 [Jan 89], $3.50, 344pp, pb) Fantasy novel about two enemies who unite to save both their peoples. A first novel. Where the Towers Pierce the Sky Marie Goodwin (Macmillan Four Winds 0-02-736871-8, Oct 89 [Nov 89], $13.95, 173pp, hc, cover by Lauren Mills) Young-adult time-travel fantasy. A young 20th-century girl finds herself in the middle of the intrigue surrounding Joan of Arc. Ride the Wind John Gordon (The Bodley Head 0-370-31279-1, Feb 89, £7.95, 175pp, hc, cover by Keith Scaife) [Giant Under the Snow] Young-adult fantasy novel. Sequel to The Giant Under the Snow in which the golden treasure is again under threat from the Warlord. Stalkers ed. Ed Gorman & Martin H. Greenberg (Dark Harvest 0-913165-47-6, Dec 89 [Oct 89], $19.95, 310pp, hc) Original anthology of 18 horror stories of predatory killers. Also available in a slipcased limited edition of 750 copies signed by all the authors including Koontz, McCammon, Rex Miller, Joe R. Lansdale, etc. ($65.00). Three Dreams and a Nightmare and Other Tales of the Dark Judith Gorog (Putnam/Philomel 0-399-21578-6, Sep 88 [May 89], $13.95, 156pp, hc) Young-adult collection of 14 stories of the fantastic. Published in 1988, but not seen until 1989. Heart of Red Iron Phyllis Gotlieb (St. Martins 0-312-02583-1, Mar 89, $15.95, 235pp, hc) [Dahlgren] Sf novel, sequel to O Master Caliban!. Eyes in the Fire Deborah Grabien (St. Martins 0-312-03336-2, Sep 89 [Aug 89], $15.95, 250pp, hc) Fantasy/mystery novel about a woman who is psychically linked to a druid. A first novel. First American edition (Piatkus 1988 as Woman of Fire). Halloween IV Nicholas Grabowsky (Critics Choice 1-55547-292-3, Nov 88 [Jan 89], $3.50, 223pp, pb) Novelization of the horror movie. Down to a Sunless Sea David Graham (Heywood 1-85481-032-4, May 89, £1.75, 320pp, pb) Reprint (Robert Hale 1979) ecological end-of-the-world sf novel. The Bloodwind Charles L. Grant (Tor 0-812-51829-2, Jun 89 [May 89], $3.95, 246pp, pb) [Oxrun Station] Reprint (Fawcett 1982) horror novel in the Oxrun Station series. Dialing the Wind Charles L. Grant (Tor 0-812-50218-3, Dec 89 [Nov 89], $4.95, 208pp, pb, cover by David Mann) [Oxrun Station] Horror novel in the Oxrun Station series. In a Dark Dream Charles L. Grant (Tor 0-312-93159-X, Feb 89 [Jan 89], $17.95, 310pp, hc) Horror novel. Psychopath released from an asylum seeks revenge. Nightmare Seasons Charles L. Grant (Severn House 0-7278-4002-9, Nov 89, £11.95, 256pp, hc, cover by Roger Smith) [Oxrun Station] Reprint (Doubleday 1982) original horror collection. In the Oxrun Station series. This edition is titled just Nightmare Season on the cover. The Black Jade Road Kathryn Grant (Ace 0-441-06611-9, Mar 89, $3.50, 180pp, pb) [Land of Ten Thousand Willows] Medieval oriental fantasy adventure novel, second in The Land of Ten Thousand Willows trilogy. The Willow Garden Kathryn Grant (Ace 0-441-85564-4, Sep 89 [Aug 89], $3.50, 196pp, pb) [Land of Ten Thousand Willows] Oriental fantasy novel, third book of The Land of Ten Thousand Willows. Views from the Oldest House Richard Grant (Doubleday Foundation 0-385-26428-3, Dec 89 [Oct 89], $8.95, 470pp, tp) Near-future post-Collapse quasi-Arthurian fantasy with sf elements. A hardcover edition (-24951-9, $18.95) was also announced but not yet seen. Siren Linda Crockett Gray (Tor 0-812-51838-1, Feb 89 [Jan 89], $3.95, 252pp, pb) Horror novel about a siren who menaces men on land. Reprint (Avon 1982). Grimbolds Other World Nicholas Stuart Gray (Faber 0-571-15445-X, Mar 89, £1.99, 182pp, tp, cover by Clare Hemstock) Reprint (Faber & Faber 1963) childrens fantasy book. Angel Fire Andrew M. Greeley (Tor 0-812-58341-8, May 89 [Apr 89], $4.95, 352pp, pb) [Angel Fire] Reprint (Warner 1988) contemporary religious fantasy novel about a famous scientist visited by a beautiful female angel. The Final Planet Andrew M. Greeley (Legend 0-09-956460-2, Jul 89, £3.50, 302pp, pb) Reprint (Warner 1987) sf novel. Night Angel Kate Green (Delacorte 0-440-50102-4, Feb 89 [Mar 89], $15.95, 282pp, hc) Contemporary mystery set in San Francisco with fantasy elements and starring a clairvoyant detective. Sequel to Shattered Moon. Night Angel Kate Green (QPBC, Dec 89, $7.95, 282pp, tp) Reprint (Delacorte 1989) contemporary mystery with fantasy elements, starring a psychic detective and set in San Francisco. This edition is identical to the Delacorte except that it lacks an ISBN and has the jacket printed as the soft cover.